Some experts weigh in on what makes suburbs healthier places to live in. also a map scoring suburbs. Some surprises maybe. Best strategy, move to the north shore and take up volunteering it seems. The experts suggest many things to be added - walkability, better public transit, better cycling infrastructure, more density. All true and good. The lack of all of these things has one main cause - cars. And it will be very difficult to add more of the good things without taking away a lot of the cars, because the space required for the good things is currently used by cars. Roads and parking, roads and parking, roads and parking. The solutions for creating healthy places may be well-known, but they all run into the political problem of convincing people to take space away from roads and parking and give it to other things. It is this political problem we lack solutions for. Not only do we lack solutions for, we lack the politicians. At the moment they're all too busy protecting their own seats that actually running the country. It's also a catch 22 situation where people will refuse to give up their cars in order to make room for the infrastructure needed to enable them to give up their cars, they'll only consider it when the alternatives are already established. 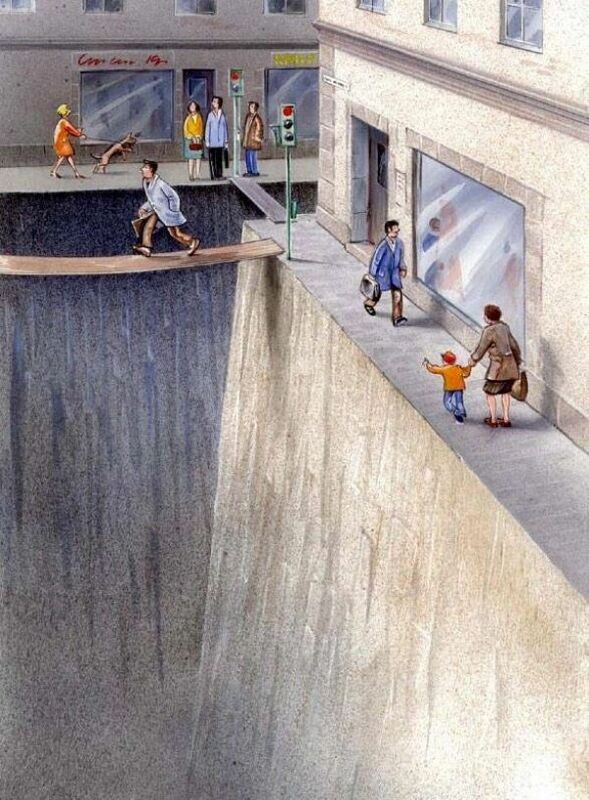 This leads the politicians to see that the only solution is to provide more space for the cars, and less for everything else. The result of which is a further dependence on the car and more resistance when residents are asked to give them up. Not sure what you mean exactly, but I'd say that excessive public roads infrastructure is always built. They had a tv news story last week or the week before, about one of those greenfield developments in the western suburbs. The couple interviewed lived in Marsden Park, suburb wasn't served by bus, and they only had one car. He worked as a baker in Westmead and started at 1:30 am and she worked more normal hours somewhere further in along the western line. They'd both drive to his place of employment and she'd sleep in the car for the next 6 or 7 hours, because getting to Schofields train station was apparently impossible otherwise. All well and good to ask for public services in low density suburbs, but you'd probably be looking at an ideal commuter bike ride, 6 or 7km at worst, on relatively flat terrain. They appeared Indian/Sri Lankan, but already with a western mentality! why on earth would they buy in such a suburb in the first place, given their circumstances? Marsden park is about 5-6km from Riverstone Station -- why not walk? Sleeping in a car for six hours is by their own (strange) choice. ....he might go off to work with a smile on his face. - and she no doubt got a free breakfast in the morning. Went past Schofields station today, plenty of bike parking both sides even. Depressing looking at that landscape though, used to see wallabies virtually every time, now cheek by jowl 2 storey boxes mostly facing east /west and no space for greenery to cool them down. A mate was involved in a land release out near there a few years back, they basically had to cook huge amounts of topsoil because of chemical contamination - would give you pause to wonder what's under the old airport site they've already bulldozed straight to a street layout. Middleton Grange on the M7 only got 1.5 stars. Hoxton Park next door got one star. The road still seems to end just before the M7 cycle path (anyone been along there recently? ), but the crazy thing is there is no access to the path for the locals, although only a lowish fence. Hemsworth Av seems to run to join the cycleway but again, a fence. You have to go south to Hall Cct before you can get on to the M7 cycleway. Nearest shops in Carne Hill about 4.5 km away and no cycleways marked through the suburbs, or to the schools, but a shared path on busy Cowpastures Rd. You could even get to Bunnings if you were brave. On the whole, pretty poor cycling infra for a new area. Liverpool Station is about 9 km away and you could ride there on cyclepaths most of the way on M7 and Hoxton Park Rd etc, or use the Transitway cycleway to get to the industrial areas around Wetherill Park or to Parramatta eventually. Leppington, another growth area, is about 7 km away. Some half arsed bike lanes near Leppington Station I hope arent indicative of bicycle infrastructure for the new suburb.